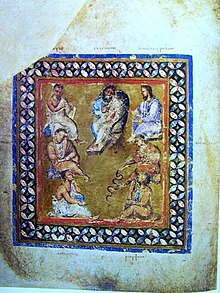 Medicine was one of the sciences in which the Byzantines improved on[clarification needed] their Greco-Roman predecessors, starting from Galen. As a result, Byzantine medicine had an influence on Islamic medicine as well as the medicine of the Renaissance. ^ a b George Saliba (2006-04-27). "Islamic Science and the Making of Renaissance Europe". Retrieved 2008-03-01. ^ "Byzantine Medicine - Vienna Dioscurides". Antiqua Medicina. University of Virginia. Retrieved 2007-05-27. ^ Some noteworthy exceptions to this tolerance include the closing of the Platonic Academy in 529; the obscurantism of Cosmas Indicopleustes; and the condemnations of Ioannis Italos and Georgios Plethon for their devotion to ancient philosophy. ^ Anastos, Milton V. (1962). "The History of Byzantine Science. Report on the Dumbarton Oaks Symposium of 1961". Dumbarton Oaks Papers. Dumbarton Oaks, Trustees for Harvard University. 16: 409–411. doi:10.2307/1291170. JSTOR 1291170. ^ "John Philoponus". Stanford Encyclopedia of Philosophy. 8 June 2007. Retrieved 14 December 2017. ^ Wikander, Orjan. 2000. "Handbook of Ancient Water Technology". Brill. Page 383-384. ^ Temkin, Owsei (1962). "Byzantine Medicine: Tradition and Empiricism". Dumbarton Oaks Papers. 16: 97–115. JSTOR 1291159. ^ Tucker, Spencer C. 2011. “The Encyclopedia of the Vietnam War: A Political, Social, and Military History”. ABC-CLIO. Page 450. ^ "Greek Fire Grenades". ancient.eu. ^ "Introduction to Astronomy, Containing the Eight Divided Books of Abu Ma'shar Abalachus". World Digital Library. 1506. Retrieved 2013-07-16. ^ a b Pingree, David (1964). "Gregory Chioniades and Palaeologan Astronomy". Dumbarton Oaks Papers. 18: 135–60. ^ King, David A. (March 1991). "Reviews: The Astronomical Works of Gregory Chioniades, Volume I: The Zij al- Ala'i by Gregory Chioniades, David Pingree; An Eleventh-Century Manual of Arabo-Byzantine Astronomy by Alexander Jones". Isis. 82 (1): 116–8. doi:10.1086/355661. ^ Joseph Leichter (June 27, 2009). "The Zij as-Sanjari of Gregory Chioniades". Internet Archive. Retrieved 2009-10-02. ^ a b Robins, Robert Henry (1993). "Chapter I". The Byzantine Grammarians: Their Place in History. Walter de Gruyter. p. 8. ISBN 3-11-013574-4. This page was last edited on 11 December 2018, at 21:33 (UTC).